Even in “peacetime”, Colombia continues to be plagued by human rights abuses and gender and economic inequality. Join us at LASC for a panel discussion on where Colombia is now and where it is headed. Pablo Cortés Ferrández: A PhD candidate and researcher of the Human Rights Institute Pedro Arrupe of the University of Deusto (Bilbao, Spain), working on the contribution of humanitarian action in urban informal settlements. He has been working in the case of Colombia for several years, looking first at intra-urban forced displacement and now at humanitarian protection and resilience in informal settlements. As a researcher, he also works on the European Union’s Horizon 2020 project “Preparedness and Resilience to address Urban Vulnerability (PRUV)” and collaborates in the Research Seminar for Peace (Zaragoza, Spain). Silvana Aimola: a Colombian lawyer with extensive experience working with victims of the conflict. Silvana holds a postgraduate degree in International Human Rights Law from Externado de Colombia University in Bogotá. Her experience includes work as a legal advisor to both the National Victims Unit and National Protection Unit, as well as a period working on behalf of victims at the Municipal Government of Bogotá. Sinéad McGrath: a PhD Candidate in the School of Politics and International Relations (SPIRe) in University College Dublin. 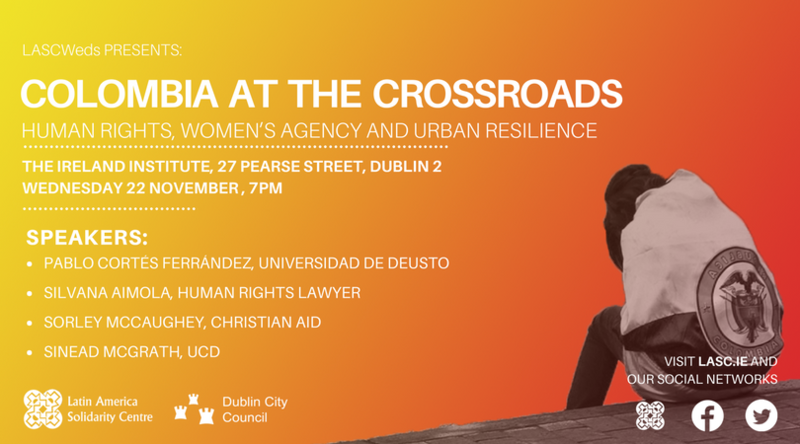 Sinéad has worked extensively in Latin America with migrant communities in Brazil and Argentina, and with the UN High Commissioner for Refugees in San Jose, Costa Rica and Geneva, Switzerland researching the Detention of Asylum Seekers in the Americas and Gender-Based Violence respectively. Her current research examines Transitional Justice Mechanisms in Colombia and Liberia to identify the factors influencing internally displaced women (IDWs) and female refugees in reclaiming agency within these post-conflict mechanisms. Sorley McCaughey: Head of Advocacy and Policy at Christian Aid. Sorley is responsible for Christian Aid’s policy and advocacy work, particularly around tax justice, climate justice and Israel and the Occupied Palestinian territories. Before joining Christian Aid he worked with the United Nations Development Programme (UNDP). He has worked mainly on issues of good governance and anti-corruption in the Middle East and various African countries.